Yes, I was one of those people that got up at 4 AM to watch the fairy tale wedding of Prince William and Kate. The wedding was flawless. The bride was stunning in her Sarah Burton Dress and Prince William in his Military uniform. I also watched Diana marry Prince Charles and watched her funeral, so naturally I would want to to see a happy occasion like the Royal Wedding! I won't bore you with any more of the details, because they are all over the web and TV. To watch such a pompous occasion, you need a hat, which is my sun hat with a few decorations, which matched my PJ's perfectly.. Then, you have to have English Breakfast Tea in your English China teapot and cup. Exquisite! Finally you will be eating scones, with Lemon curd. I made Tart Cherry Scones, but I didn't have time to make the Lemon curd. I have been very busy working on the Bake Sale. 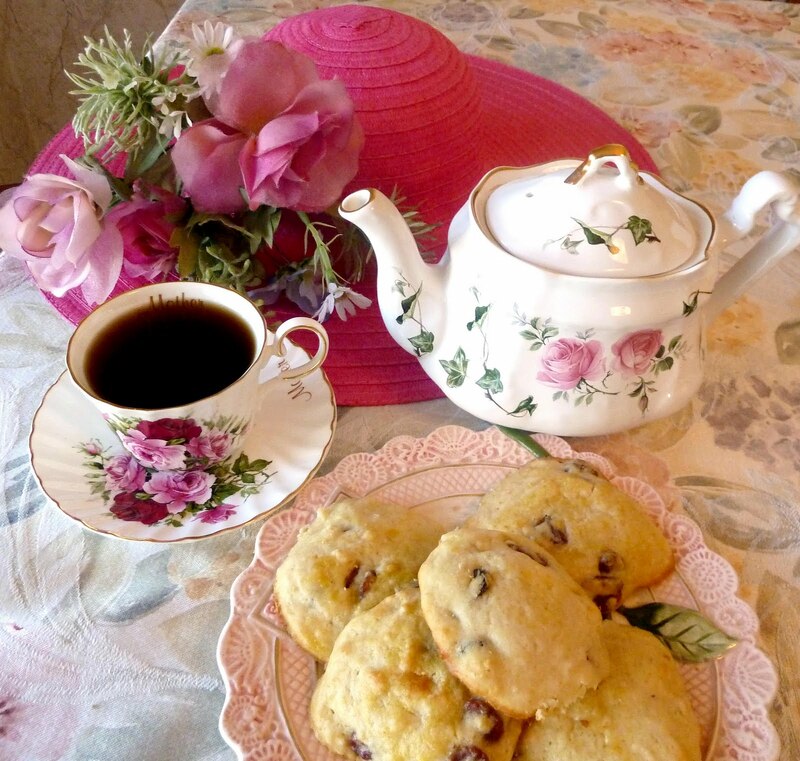 My husband and I ate the tender scones, and drank the tea, before he had to go to work. A wonderful time was had by all. I promised you an update on the Online Bake Sale, so here it is. I'm so excited for Monday May 2nd. There will be a preview with pictures of the all the donated bakers, to whom I am so grateful for their help and support. Preheat oven to 400 degrees Make about 9 medium size scones. Hope you had a lovely time at the Tea Party! I can't believe you got up to watch it, good for you, I can't drag myself out of bed at that hour. Hope you have a great weekend. Can't wait for Monday. What a pretty picture! Love cherry scones! Oh, they look so good! I certainly appreciate all your comments and support. I set my alarm for 3am, got up, watched 30 seconds and went back to sleep! haha! Very excited for the bake sale and those scones look so easy and delish! Molly- I hope that you have a DVR:) The scones are perfect for any princess! I got up at 4 just to go to work! Looks like a great group of bloggers, I won't know what to bid on, so many wonderful treats! Your Tea party is gorgeous, the royal would have loved it! Chef Dennis- thanks so much for being a baker! I certainly appreciate all of your help and support. I'm excited about the bake Sake. I LOVE your hat!! So nice to see people celesbrating such a joyous occasion. This world has certainly had enough heartbreak recently so it is so nice to talk about something so happy! Perfect breakfast and I'm going to make sure I talk up your bake sale on facebook! I just know it's going to be a huge success!